Toasted Pumpkin Seeds, The Spice of Life! 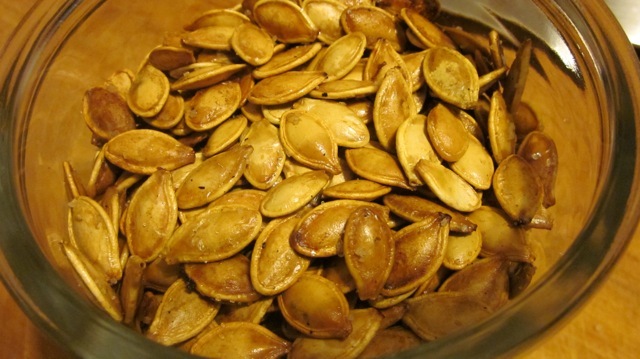 When pumpkin season is in full swing we thought we would post a family favorite, Chipotle BBQ roasted pumpkin seeds. This is a recipe that we forget about most of the year but make every year. If you live in America you celebrate Halloween. The tradition of carving pumpkins is a family favorite and toasting the seeds is a bonus for everyone to enjoy. First cut the top out of your pumpkin and spoon out all the seeds onto cookie sheets, wax paper or whatever you have. Make sure the seeds are clean and you remove as much of the stuff that is not a pumpkin seed and allow to dry overnight. The next day remove any other non seed substance you may have missed. Place the dry seeds in a bowl and toss in melted butter to coat. How much butter, you may ask. Well since pumpkins come in all sizes all we can tell you is to make sure they are all lightly coated. Next toss in a Tablespoon or so of Knox's Chipotle BBQ Dry Rub and toss until seeds are coated. Scatter pumpkin seeds in a single layer on a cookie sheet lined with foil. The tricky part, toasting pumpkin seeds. Preheat your oven to 250 degrees. Place the cookie sheet with your seasoned pumpkin seeds on the center rack and bake for about 1 hour tossing every 15 minutes. This is tricky because pumpkin seeds are thin and will burn very quickly. Tossing them helps make sure they do not, but keep a close eye on them. This simple but tasty preparation can be made to order. If you like curry, try curry toasted pumpkin seeds. 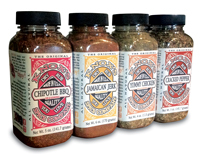 Maybe you like something a little more Cajun, use your favorite Cajun spice blend or Jamaican jerk seasoning. The sky is the limit and we hope you enjoy your pumpkins from the carving right down to eating the toasted seeds.